In his previous incarnation Lord Abhinandannath's soul was Purushasimha, son of Vijayasen, king of Shankhpur town in the Purva Mahavideh area. While he had gone for a walk in the garden one day, the prince listened to the discourse of Acharya Vinayanandan Dev. He became detached and a turned ascetic. As a result of vigorous penance and higher spiritual practices, he earned the Tirthankar-nam-and-gotra-karma. Completing his age, he reincarnated as a god in the Vijayant dimension. From Vijayant dimension, the soul that was Purushasimha descended into the womb of queen Mangalavati/Sumangala, wife of king Megh of Ayodhya. The news of the queen being pregnant made the atmosphere of Ayodyha live with happiness and joy. One day two women and a little boy came to the king's court to seek justice. One of the women put forth her case before the king, "Sir! We both are wives of a rich seafaring merchant. Our husband has left for his heavenly abode leaving behind we two, a son, and heaps of wealth. The child truly belongs to me but this second wife of the merchant claims to be her. This is nothing but a conspiracy to grab the wealth that would be inherited by the child. Save me, my Lord! I seek my son and justice from you." The story narrated by the other woman was also the same. Shouting charges and counter charges at each other, both the women claimed the possession of the child. The child could not indicate his true mother as he had got equal affection from both. As the boy was born in some remote place, there was no eye witness available. The king was in a quandary. Even after a lot of probing and weighing the evidence he could not solve the problem. Any ill conceived solution could end up in doing injustice to the innocent. The king and his ministers all were in a fix. The night was approaching and the king was getting late for his dinner. He adjourned the case and went into the palace for dinner. The queen asked, "Today you are late for the dinner, your highness. What is the matter? Was there some complex problem?" The king narrated the case of the two women and their child and said, "No one is able to say firmly, which one of the women is the real mother of the child and which one is the pretender?" The queen said with a smile, "Your Highness, let a woman solve the problems of women. Send the case to me and allow me to resolve the issue." Next morning the queen herself came to the king's court. Both the women and their son were produced before the queen. There was no apparent indication in the behavior and disposition of the two women that could give any indication of the genuineness of one. All of a sudden, the queen got an inspiration and she said, "This enigma has no simple solution. There is one object and two claimants. The object, being a person, cannot be split into two. Under the circumstances the only solution I can think of is to keep the matter pending. I carry a pious soul in my womb. Let us wait till it is born and is ready to resolve this issue. during the period of waiting, let the son and the property of the deceased be taken into the custody of the state. Till then the claimants may wait." Hearing all of this one of the claimants readily accepted the arrangement but the other started weeping. In a choked voice she said, "No! Please don’t separate me from my son. I will not be able to survive without my son for such a long period, I withdraw my claim. Let the other woman take the child as well as all the property of my husband. My only submission is that I may be allowed at least meet the child. I will be contented with that only." The queen recognized the pain and concern of a mother’s heart. She gave her judgment, "The woman who immediately agreed to my proposal is the impostor. Her attachment is not to the child but to the wealth. She may be imprisoned. The one who wants to surrender her claim is the real mother. The child and the wealth may be given to her with all honor." Everyone present in the assembly was dumbstruck by this witty method of judgment. The impostor pleaded guilty and submitted to be pardoned. On the eighth day of the bright half of the month of Vaishakh, the queen gave birth to a son. A wave of peace and goodwill swept the whole world. Appreciating the fact that the marked improvement in wisdom and sense of judgment during the pregnancy was the influence of the presence of the illustrious and pious soul, king Megh named the new born as-Sumati (wisdom or right thinking). When Sumatinath grew up he was married to many princesses. Once his father, King Megh, told his wife that he wished to give the responsibility of the kingdom to Sumatinath, since he is grown up, married and hoping to become a father very soon. He also said that he wished to go on the path of devotion and meditation and leave all the worldly things. This worried his queen and she started weeping. At this time his son, Sumatinath, consoled his mother and said, “Mother, it is not good to stop any holy soul to lead on the path of ‘sadhna’. He is a going on the path of salvation, so we should not stop him”. King Sumatinath thus handled his kingdom with great wisdom, but one day while in deep thoughts, Sumatinath thought about his father and suddenly he heard somebody (probably his inner soul) say, “Lord! the entire humanity is waiting for you, the world of knowledge is waiting for you, start with the real purpose of your life”. He became detached with materialistic things. For the entire year he distributed the wealth from his both hands among the people. On Vaishaka Shukla 9, in Ayodhya, in a jungle, he removed his hair in just five hand full, removed all the worldly things from his body and became and ascetic and disappeared in jungle. For 20 years he was on constant meditation and ‘sadhna’. He attained omniscience under a Priyangu tree on the eleventh day of the bright half of the month of Chaitra. He established the four pronged religious ford and became a Tirthankar. 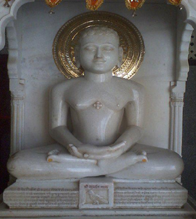 On the ninth day of the bright half of the month of Chaitra he got Nirvana at Sammed shikharji.